During the sixty years of my academic career, I have been indebted to senior people, friends, colleagues, and former students on innumerable occasions. But Millie stands out from all the others. Our long acquaintance and long friendship has so greatly influenced my life and my career that I must acknowledge her significance. I owe her so much. I first met Millie in the period of August 17 - 21, 1970, when I was in Boston to attend the 10th International Conference on the Physics of Semiconductors (ICPS). I was there to give a talk on tellurium. Since my talk in the tellurium session was scheduled to take place shortly after Gene and Millie’s talk, Millie came up to me immediately after the session ended and introduced herself. Then, she invited me over to her house that night, so we could continue to discuss my theory. After that initial meeting, we continued to communicate with each other, regularly and often. We both had keen interests in the similarity between the k-linear behavior in the valence band of tellurium and graphite, and our discussions often centered around this interest. One day, she suggested that perhaps she and I should work together by applying to the US-Japan Cooperative Research project to begin a project on the electronic properties of graphite. I readily agreed. One year before the commencement of this project, Prof. Yasutada Uemura and I were discussing the possibility of inviting Millie, Gene, and their family to come to Tokyo for a while. We thought this would give us the opportunity to work together in friendship. Prof. Duck Joe Kim of Aoyama Gakuin University, upon hearing our discussions, kindly suggested to us that the physics department of Aoyama Gakuin University would be happy to invite Millie as a distinguished visiting professor, and — if she agreed — the university would provide a guest house to her family. We told Millie, who happily accepted this kind offer. Moreover, we succeeded in inviting Gene as a visiting professor to the physics department of University of Tokyo, made possible thanks to a grant by the Japan Society of Promotion of Science (JSPS). With this joint-invitation, Millie, Gene, and their four children came to Tokyo by two different flights, Pan Am and JAL, that arrived at Haneda at 3:35 PM and 3:20 PM on the afternoon of June 16, Saturday, 1973, respectively. 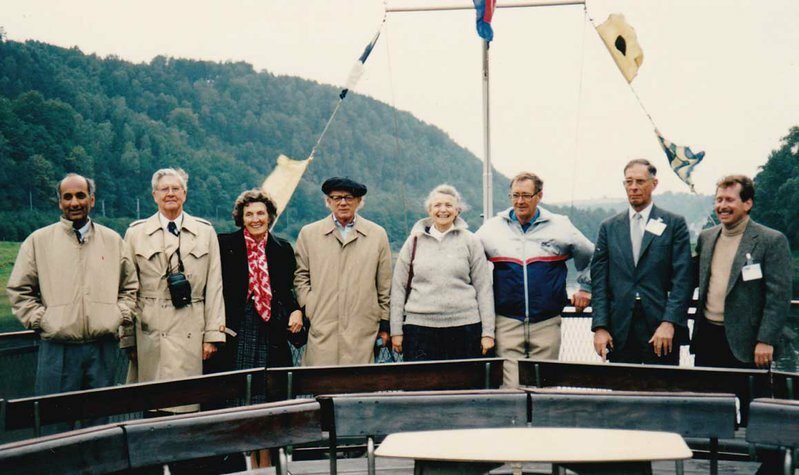 From June 16 to July 28, 1973, the Dresselhaus family stayed in a large guest house in the Chitosedai campus of Aoyama Gakuin University, thanks to the university’s warm hospitality. 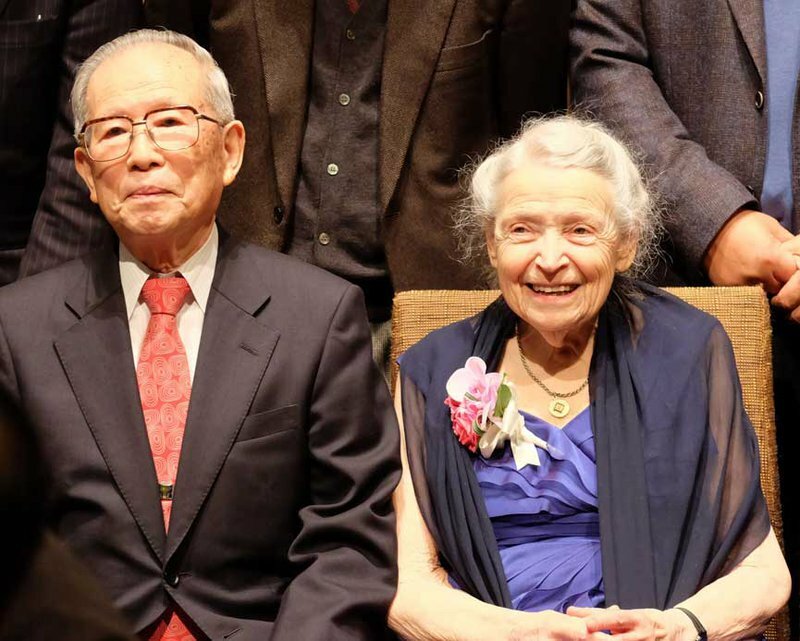 Millie and Gene’s marvelous lectures gave the physics graduate students of both the University of Tokyo and Aoyama-Gakuin University a wonderful chance to study the optical properties of solids and magneto-optical properties of semimetals, etc. all in a short period of time. While their parents lectured, the four children, Marianne (14), Carl (12), Paul (10) and Elliot (8) mainly concentrated on their extensive musical studies, practicing piano, violin, and cello. During their one-month stay in Tokyo, I developed a close friendship with Millie and her family. Millie and I applied for a US-Japan Cooperative Research project on the electronic properties of graphite from the National Science Foundation (NSF) and JSPS. Fortunately, both NSF (on the US side) and the JSPS (on the Japanese side) approved our proposal. 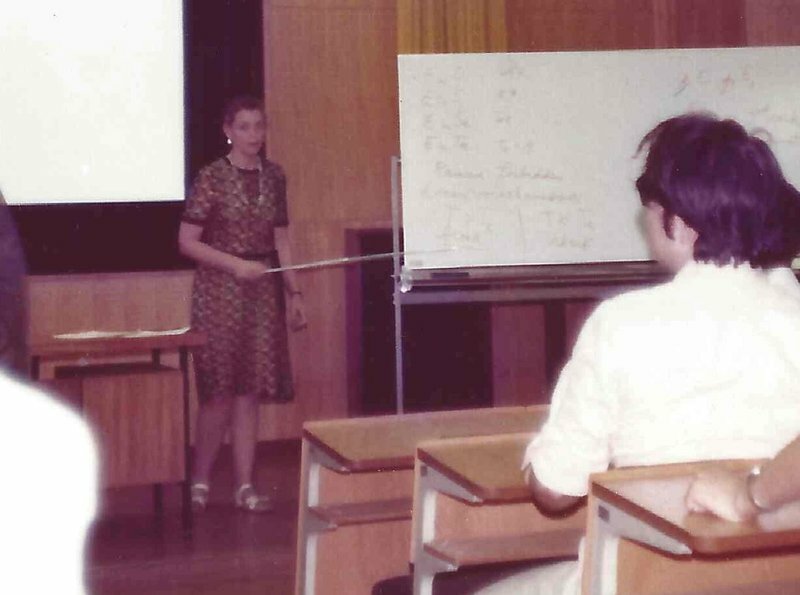 On July 1st, 1974, Millie and I started the first US-Japan Cooperative Research project on graphite. Although this project was scheduled to end March 31, 1976, we succeeded in extending the project until March 31, 1977, which we could do by adding a new subject to our research: the electronic structures of graphite-intercalation compounds (GIC). Thanks to this program, I first visited MIT on a trip lasting from Monday, July 8 to Friday, July 12. During my one-week stay in MIT, I resided in Harvard Commander Hotel in Cambridge. Every morning, Millie kindly picked me up at the Hotel and took me to her office and lab, where I was able to work closely with Millie, Gene, and their collaborators at MIT. Every evening, Millie and Gene kindly invited me to dinner at their home in Arlington. While Millie prepared dinner, I played baseball with Paul, Eliot, and Gene in the park behind their house. I will never forget Millie and Gene’s hospitality, and nor her delicious dinners. On Saturday, July 13, 1974, both Millie and I left Boston for Stuttgart, in order to participate in the 12th ICPS-12, which was held in Stuttgart from July 14 to 18. Since then, Millie and I often attended ICPS conferences together, and we enjoyed it so much that we began attending international GIC conferences together, too. It was Millie who first suggested me that I should promote closer ties between American Physical Society and the Physical Society of Japan. In 1984, Millie became the first female president of the American Physical Society (APS). At that time, I was also elected to President of the Physical Society of Japan (JPS). Immediately, Millie contacted me. She wanted to enhance mutual understanding through international exchange between these two physical societies, and she tasked me with creating a plan to achieve that purpose. As a result, the two societies concluded a mutual agreement on the extension of each society’s privilege to the partner’s society. For example, JPS members could register at APS meetings using the lower APS membership rate, and vice versa. At that time, APS had a very cheap student-registration fee for their meetings, which meant that thanks to our policy, many Japanese graduate students (more than 500) began to participate regularly in APS meetings and give talks. 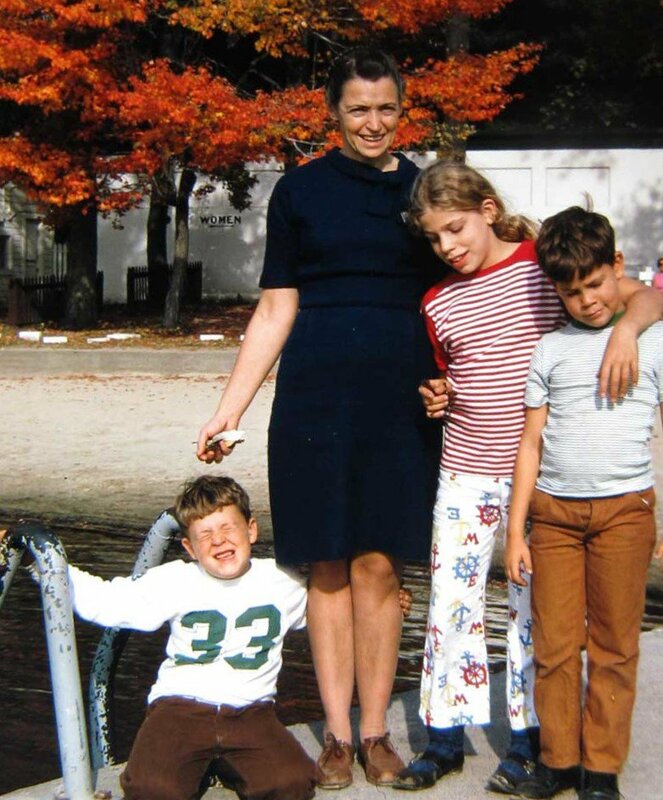 In this way, her thoughtfulness helped JPS to more fully integrate into the international scientific community. Even to this day, many members of the Physical Society of Japan continue to benefit from this initial connection. Millie and Gene attended the above Symposium. Since the EXPO Tsukuba 1985 overlapped this Symposium period, participants in this symposium increased. 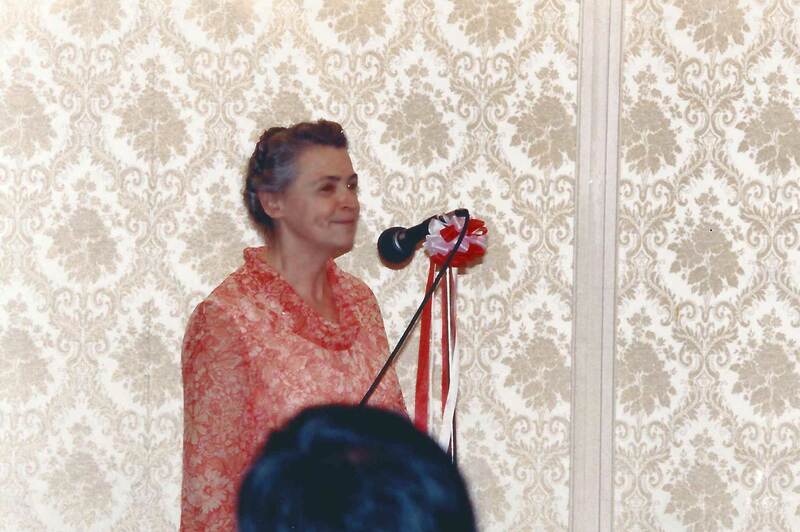 Below, I’m sharing two snapshots of Millie and Gene during this symposium: the first, of the opening address, and the second, of the Japanese lunch meeting which included all the international advisers. Millie Dresselhaus, Jack Fischer, D. Guerard, Gene Dresselhaus at the VIP Dinner at the Tsukuba EXPO in Japan. The Assembly was held at the Hotel Bellevue in Dresden during the final days of the German Democratic Republic. Besides President and the IUPAP officials, 88 delegates from the liaison committees of 44 countries, commission chairmen, and observers attended at Assembly. Millie and I met there — Millie, after all, was one of the US delegates, while I was the chairman of the semiconductor commission. In the boat trip excursion on the Elbe river on September 27, I used my personal camera to take a group photo of all the US delegates on the ship. 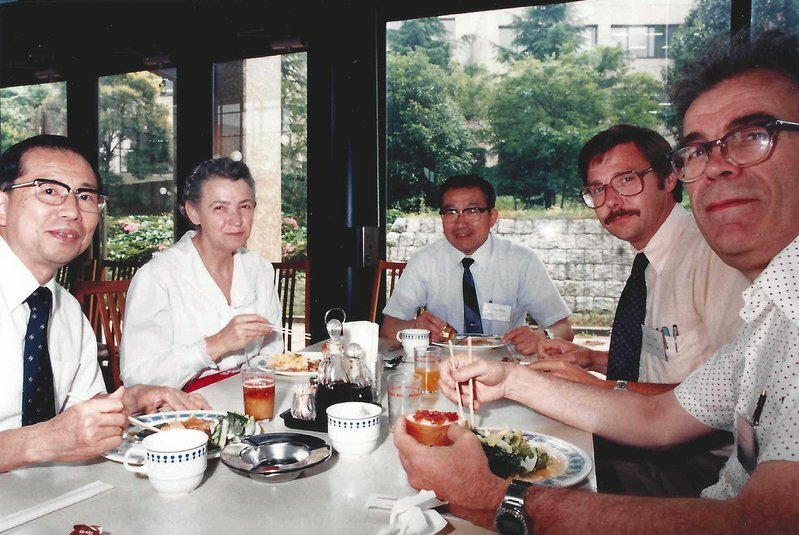 When I retired from the University of Tokyo at age 60, my PhD students organized a retirement party in the Imperial Hotel in Tokyo on March 28, 1991. Among 265 guests who attended were Millie and Prof. Marvin Cohen, both of whom gave marvelous speeches for me. 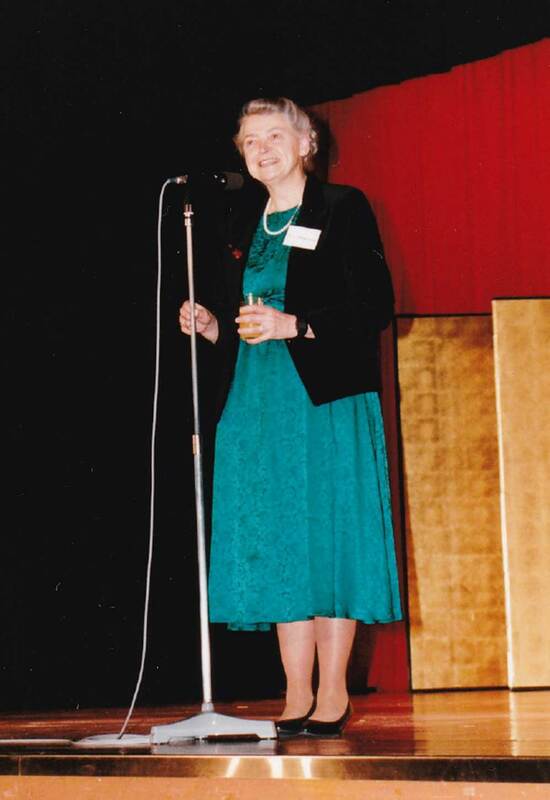 Below is a picture of Millie giving her speech on the stage of the banquet hall. Millie gives a speech honoring Prof. Kamimura at his retirement party. Almost one year ago, on February 17, 2016, I met Millie at the Ceremony of Honorary Degree of Tohoku University in Sendai. (February 17, 2016). 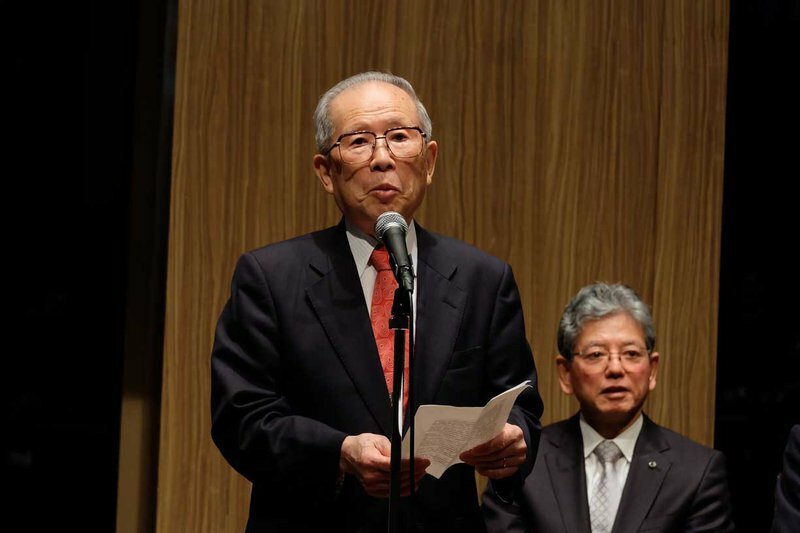 At the Ceremony, I was greatly honored to delivery a congratulatory address to Millie, in the presence of the President of Tohoku University and a number of distinguished guests. That night, we stayed in the same hotel, and the next morning, we had a Japanese breakfast together, along with some very pleasant conversations. 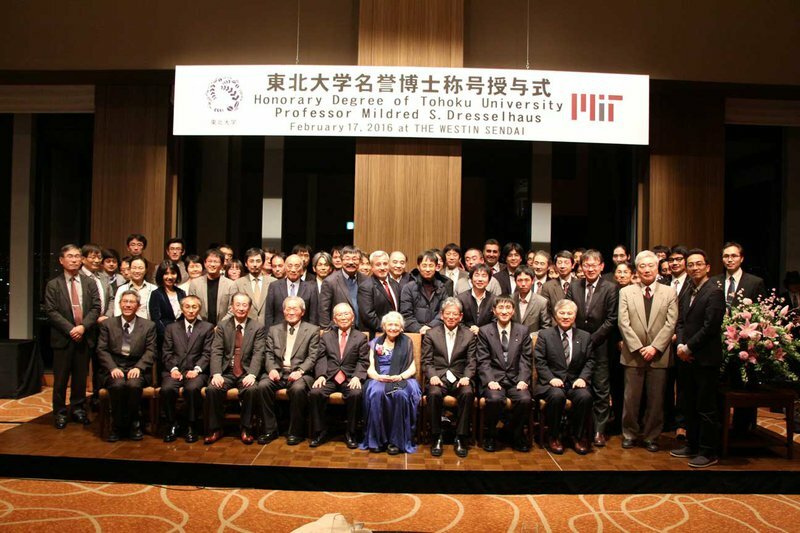 Then, she gave a marvelous talk entitled “50 years of Carbon Nanotube”, at the end of the Symposium celebrating her Honorary Degree at the physics department of Tohoku University. Throughout these two days, she seemed so vibrant and full of life. I never imagined that this would be the last time I ever saw her. This ceremony was held in Westin Hotel Sendai on February 17, 2016. I was very honored to attend. The group photo after the ceremony is shown above. To Millie’s right is the President of Tohoku University, Prof. Susumu Satomi, and to Millie’s left is me. Millie was a very important and insightful scientist, a great academic leader, and a wonderful human being. Her passage is a loss that will be greatly felt for a long time. We will all miss her presence.